Slim lightweight pads that don’t cost a fortune (click to enlarge). 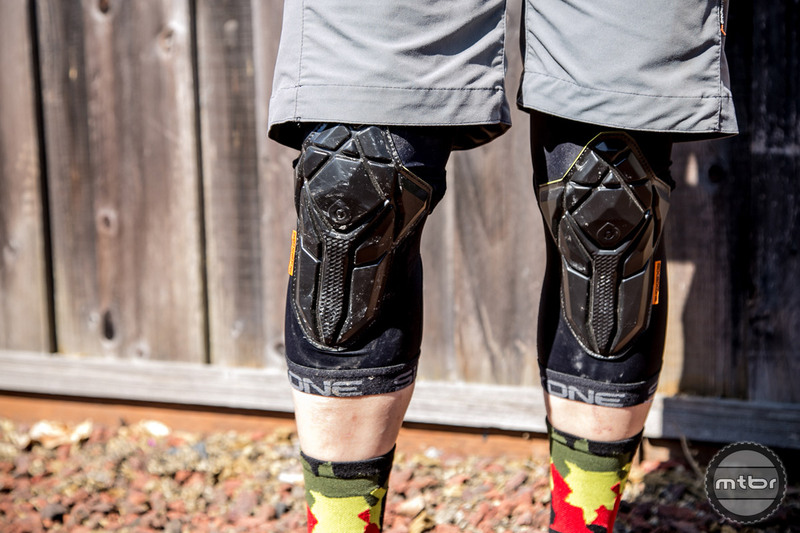 The lightweight knee pad market has exploded in recent years and the newest from SixSixOne sets itself apart from the field by focusing on ventilation and fit. They don’t offer a downhill race level of protection, but the XRD technology does provide impressive energy dissipation for its size. Crashing is an inevitability in our sport. It’s why we all wear helmets. It’s also why I choose to wear knee pads. In the past that meant strapping gear to my bag and suiting up before descents. But times have changed. The current trend is toward lightweight kit that is comfortable on climbs, yet still offers protection on descents. 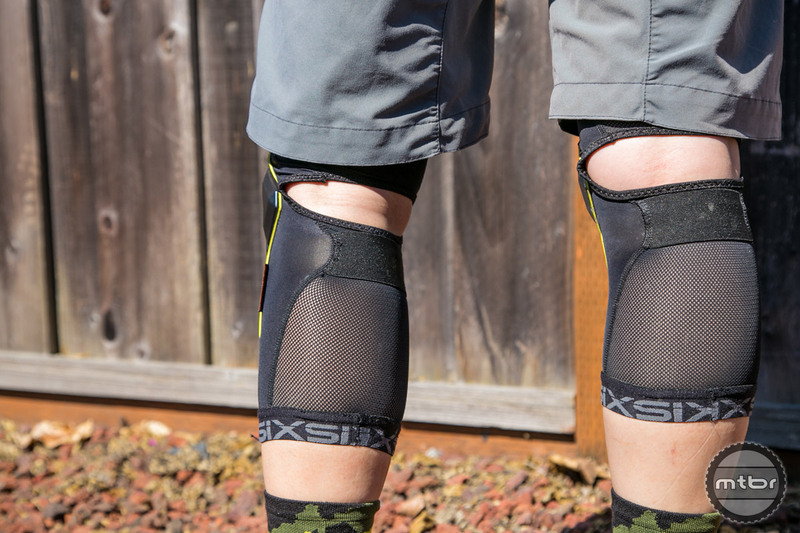 This approach is exemplified by products such as the SixSixOne Recon Knee. These ultra breathable slip-on pads utilize a protective padding made from Poron XRD. Under normal conditions this material is soft and contours to your body. But it hardens on impact to help dissipate energy. There are a number of materials on the market that react similarly, but what makes XRD special is the ergonomics. Unlike D30 or VPD, XRD can be molded into complex shapes with flanges that allow it to flex more naturally. The segmented XRD pad allows the kneepads to contour to the body, making them comfortable to wear even when climbing (click to enlarge). These built-in relief channels allow these pads to feel like little more than a set of knee warmers, yet still offer impressive protection considering. I’ve dismounted hard enough to bruise myself in these pads, but have never gashed myself through them. As a result, I wouldn’t recommend them for pure downhill use, but they’re great for everything from cross-country epics to trail riding. I also love that they’re thin enough to be worn inconspicuously under jeans. The Recon utilizes a similar form factor as fellow pad maker G-Form, but have a mesh backing and cut-outs for improved breathability and less chaffing (click to enlarge). There are a number of brands who license the XRD material and manufacture similar padsets, but what sets SixSixOne’s version apart is the chassis. 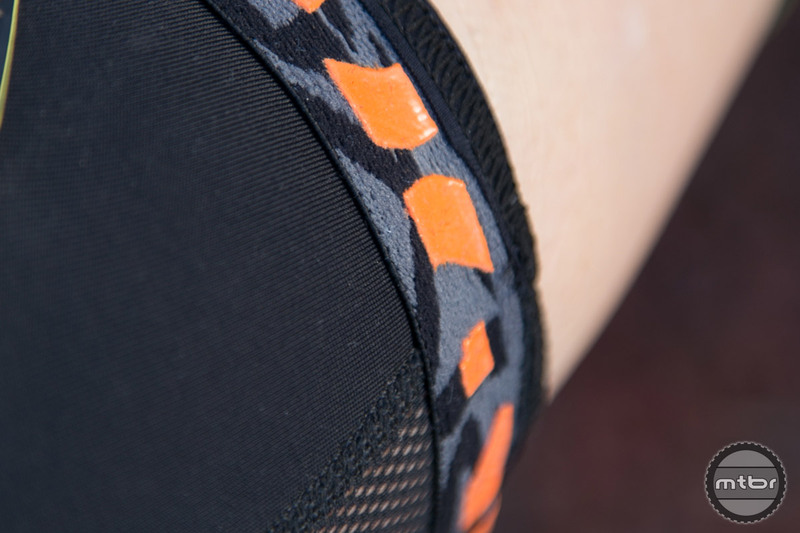 The XRD pad is mounted to a Lycra sleeve with a mesh rear panel that has a large cut-out behind the knee to minimize chaffing. Two elastic straps at the top and bottom of the garment have internal silicon printing to minimize slippage. There’s also an elastic strap that goes over the calf located just under the knee. I’ve had zero issues with the pads sliding while riding, but have found that this calf strap has a tendency to ride up and sometimes bunch. It’s a minor complaint for an otherwise highly comfortable product. Unlike the majority of competitors in this space who use a knee sock design with protective padding slapped on, the Recon pays subtle attention to venting and comfort to help distinguish itself in a crowded marketplace (click to enlarge). 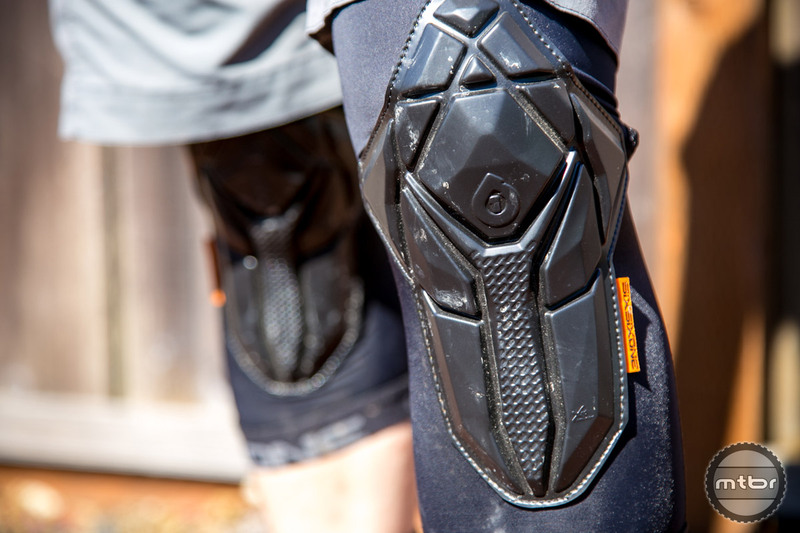 If you’re in the market for a minimal set of knee pads, the Recons are worth considering. I generally prefer something more protective for the majority of my riding, but can’t deny the allure of this pad set on hotter days or cross-country rides. Just make sure to try them on before you buy, as these pads tend to run small. For more info, visit www.sixsixone.com. Slim lightweight pads that don’t cost a fortune. 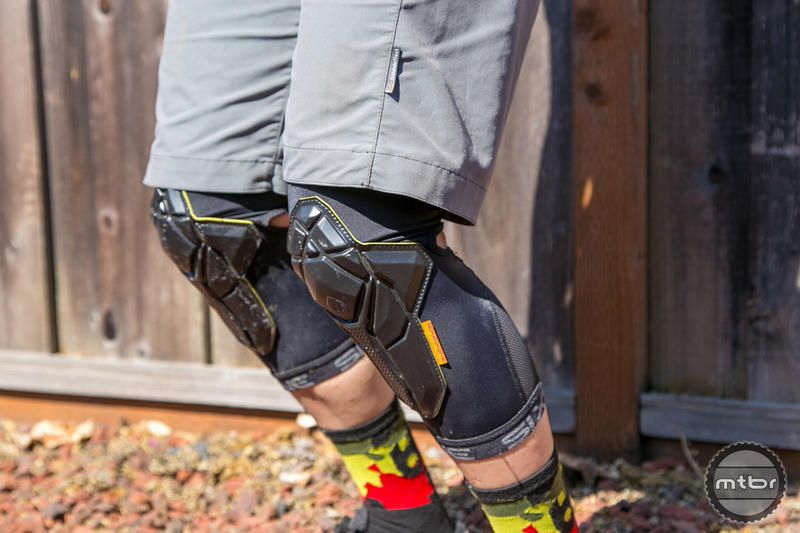 The segmented XRD pad allows the kneepads to contour perfectly to the body, making them comfortable to wear even when climbing. The Recon’s utilize a similar form factor as G-Form, but set themselves apart with a mesh backing for breathability and cut outs to prevent chaffing. Unlike the majority of competitors in this sphere who use a knee sock design with protective padding slapped on, the Recon pays subtle attention to venting and comfort to help distinguish itself in a crowded market place. Hey Charlie, any chance you bought a size too small, and are over-stressing the stitching while putting them on.